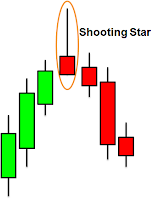 This tutorial, we are going to touch on a series of high level and necessary candlestick patterns and trends. Once we get through this tutorial, you will have a complete idea of Japanese candlestick patterns and be able to identify the different candlesticks and what they stand for. Be prepared to take at least 30 minutes to comprehend this tutorial as this tutorial is going to consist of a very long lesson. First off, we will have the hammer and hanging man pattern. As shown in the figure above, both hammer and hanging man have an absence or extremely short upper shadows. You usually see them during reversal patterns. When the market price is falling, seeing hammer in your chart will indicate that the bottom line is near and the market will start moving up again. The long lower shadow indicates that sellers tried to push prices further down but buyers were able to overcome the pressure and close the market higher than its open. Though this is usually signs that the market will turn bullish, it is better to wait for the next candlestick to confirm the bullish trend. On the other hand, when you see a hanging man in your chart, it means that buyers tried to push the market up but are gradually losing out to the sellers. This is a sign that the selling pressure is starting to override the buying pressure. As a result, the market closes below its open. This indicator works the same way as a hammer, just that you do completely different things when you see either sign. Check out the useful image below to see what to do. As you can see from the diagram, when you see a hammer, the price will usually rise while a hanging man signals the market will reverse and falls. It is better to wait for the next candlestick to confirm the trend before buying or selling. These are mainly signals and indicators and is not representative of market movements as there are times the market will just move one way. 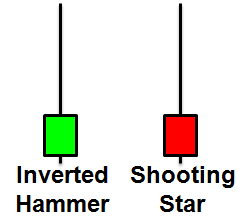 Inverted hammer and shooting star are very similar to hammer and hanging man. 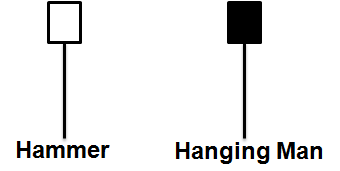 The key difference lies in that hammer and hanging man have close to or zero upper shadow while inverted hammer and shooting star have close to or zero lower shadow. What you do with an inverted hammer and shooting star is very similar to what you do with hammer and hanging man respectively. When you see an inverted hammer, it usually signals uptrend as its long upper shadow shows that buyers attempted to bid the price higher but were unable to do so as sellers tried to artificially keep the price down. Hence, the market closes above its open. On the other hand, a shooting star pattern shows that buyers attempted to bid the price up but sellers came in and bid the price lower, making the selling pressure higher than the buying pressure. As a result, the market closes below its open and this pattern shows a downtrend. An image would help in your understanding. 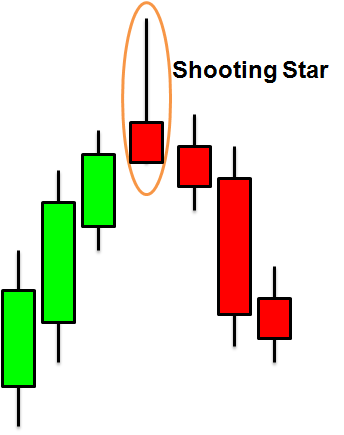 As seen from the figure above, inverted hammer, like hammer signals an uptrend while shooting star, like hanging man signals a downtrend. These are simple indicators that try to predict the trend of the market but it is rarely accurate if not used with appropriate trading strategies. So far, we have seen single candlestick patterns (an indicator of either uptrend or downtrend based on one candlestick in a period). We will now touch on double candlestick patterns, in which 2 candlesticks aligned together actually signal uptrend or downtrend. Engulfing candles are usually in pairs. 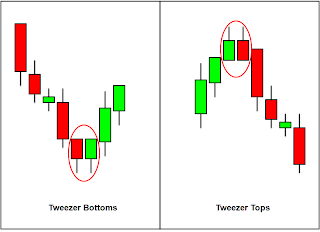 Notice the figure above, an engulfing pattern can be observed when the subsequent candlestick is larger than its preceding candlestick. 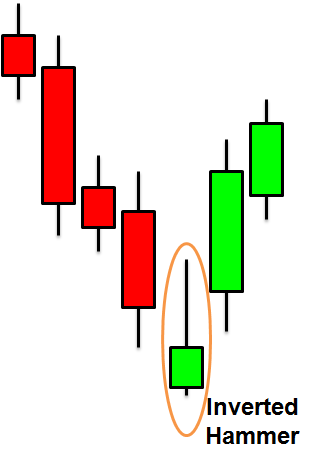 Take note that both candlesticks have to be of different colours as they signify different movements of the market. In a bullish engulfing, as with all words associated with bull, the market will move in an uptrend manner. 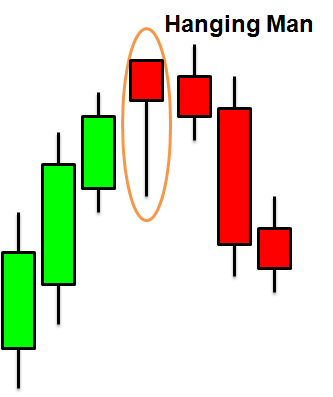 A bullish engulfing usually comprises of a red candlestick followed by an even larger green candlestick. This means there could be a strong uptrend or a period of contesting between buyers and sellers. As you can see from the figure above, the market did not immediately move uptrend but rather buyers and sellers were competing with each other before the market moves uptrend. In a bearish engulfing, as with all words associated with bear, the market will move in a downtrend manner. 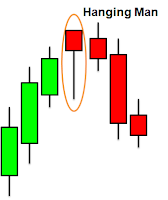 A bearish engulfing usually comprises of a green candlestick followed by an even larger red candlestick. This means that sellers overpowered the buyers and the market could be heading for a straight spiral down. 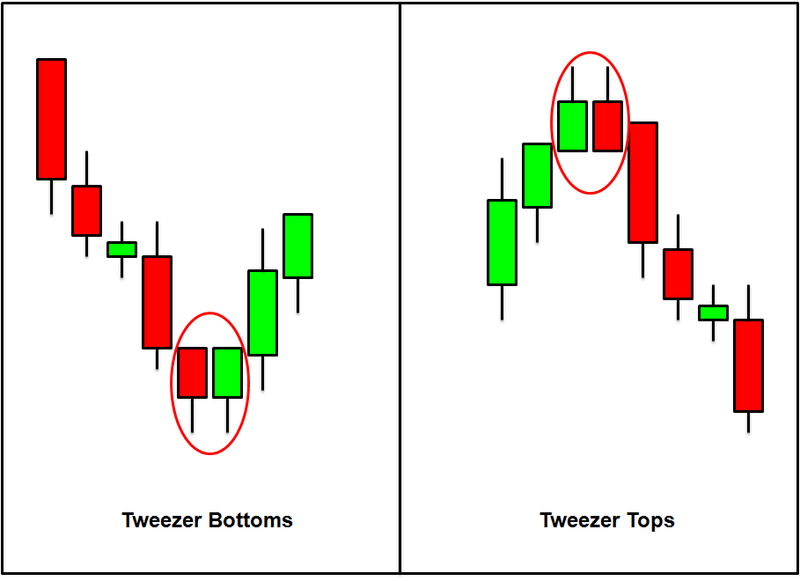 Tweezer bottoms and tops signal a possible reversal pattern. They are common after an extended period of uptrend or downtrend. Tweezer bottoms and tops are easy to identify as they look just like a pair of tweezers. The shadows of the 2 candlesticks in the tweezer bottoms or tops should be of the same length. This means that they must either share the same lower shadow or same upper shadow. 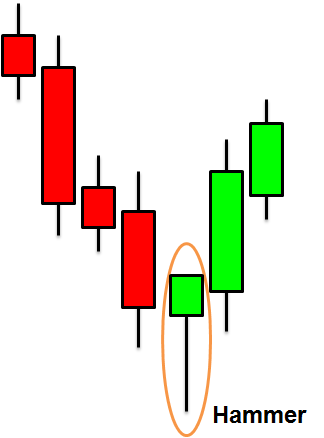 Next lesson, we will touch on how we interpret 3 candlesticks in the market. By now, you should be aware that the more indicators present in the market, the more accurate your prediction of the market movement is likely to be. We should never force the indicators onto the market, we want them to fit the markets perfectly.